This property is primarily associated with the initial period (1902-1920) of downtown commercial expansion that occurred due to local economic prosperity after the Klondike Gold Rush and in tandem with explosive population growth and suburban residential development. During this era, modern urban architectural scale began with the construction of the earliest steel-frame highrise buildings and the establishment of a concentration of banking enterprises and department stores along Second Avenue from Cherry Street to Pike Street. The initial regrading of Denny Hill and the commercial redevelopment of the former University Grounds (University/Metropolitan Tract) were major factors that facilitated northward and eastward commercial expansion. In 1914, the owners of the Frederick and Nelson Department Store purchased property with the intention of building a large, five-story store at Fifth Avenue and Pine Street, thus solidifying the location of the future downtown retail core. A significant number of extant commercial properties dating from this era remain within the downtown commercial core, including: numerous hotels, banks, business blocks and early highrise commercial buildings, as well as clubhouses, apartment houses and theaters. However, few specialty and department store building from this era remain intact and well preserved. Buildings specifically designed to be devoted to specialty retail or department store use typically included lower floor level commercial display spaces and upper floor level loft, sales and/or storage areas. The larger department store buildings were typically masonry construction and three to five stories in height, exhibited either a two or three-part commercial block facade composition, and were further dignified by prominent cornices and storefront canopies. This building type did not require as much natural light and ventilation as neighboring business blocks; thus, lot coverage and building mass could be maximized. Specialty retail and department stores typically required more elaborate interior finishes and fittings, as well as more elaborate exterior construction with large display windows in order to exhibit merchandise and often with ornate canopies providing pedestrian protection. As the retail district expanded along First Avenue and uphill along Second Avenue, a fairly wide range of store buildings were designed and constructed according to specific use, lot size and location. By 1910, a distinct concentration of specialty and department stores were located along Second Avenue from Marion Street to Pike Street. The Rialto Building (1894, destroyed) at Second Avenue and Madison, housed the Frederick and Nelson Department Store, which was one of several major retail enterprises that made Second Avenue a fashionable shopping district, including the Bon Marche Store (1896, 1902, 1911, destroyed) at the SW corner of Second Avenue and Pike Street. The street included at least five other major buildings, including: the Arcade Building/Rhodes Store (1903, destroyed), the Galland Building/Stone Fisher Lane Store (1906); the Chapin Building/ McDougall and Southwick Co. (1907, destroyed); and subject J.A Baillargeon Store (1908); all housing specialty and department stores with expansive street frontage and located at prominent street intersections. The property is also associated with a crucial period (1950-1966) during which downtown commercial redevelopment began to occur after nearly thirty years of stagnation as several major modern municipal government and commercial buildings were constructed and numerous older buildings were remodeled, updated and expanded.. The J. A Baillargeon & Company Building is one of Seattle’s earliest entirely terra cotta clad buildings, along with the Central Building and the Moore Hotel and Theater, which all date from 1907-08. It was originally designed by the architectural firm of Saunders and Lawton and constructed to serve as dry goods and fancy furnishings store. After several years of study of buildings devoted to similar businesses by J.A, Baillargeon, it was constructed at a construction cost of $475,000 by the entrepreneur’s brother, Philip A. Baillargeon. Its fireproof construction involved an innovative steel grillage foundation design that had been previously used for highrise construction on the East Coast. The particularly strong four-story steel frame building was under construction in June 1907 and was designed to support an additional four floor levels. The J.A. Baillargeon & Co. Building was completed and opened to public in September 1908. It was described in the local press as a “white palace” and included particularly large window opening and glazed areas for the era. The elaborate store interior included luxurious and expensive finishes, furnishings and fittings, including: highly ornamental plaster work; bronze handrails; marble and mahogany finishes and detailing; high ceilings; velvet carpets; and oriental rugs. There were several ways to ascend to the upper floor levels by elegant stairways, three high-speed elevators and by escalators in addition to regular freight elevators, as well as the most modern ventilation and heating systems. The mezzanine level overlooked the main floor level and included cloak rooms, marble-clad restrooms and waiting rooms with writing tables for ladies and for gentlemen and a small tearoom and buffet luncheon area. Located on the third floor level were an emergency hospital, as well as marble-clad restrooms and reclining rooms, and lunchrooms for male and female employees. By 1908, Joseph A. Baillargeon had been involved in the dry goods business in Seattle for over 25 years. After working for others in Ohio and California, he migrated to Seattle and operated the dry goods department for the Schwabacher Brothers and Company. He established his original specialty dry goods store, Latour and Company, in 1885 in the Stevens Hotel on First Avenue between Columbia and Cherry Streets. A second store location at First Avenue and Columbia Street was destroyed in the fire of 1889, after which he set up in a tent at Second Avenue and James Street. Known then as the “Lace House” this enterprise was then temporarily located in the reconstructed Occidental Hotel building. Once the Collins Block was completed in 1893, it moved permanently back to Second Avenue and James Street where it remained until the completion of the new ‘white palace” six blocks to the north. In 1903, J.A. Baillargeon purchased the building site and by February 1907 it was announced that an eight-story building designed by architects Saunders and Lawton would be constructed at a cost of $400,000. The original store was designed, in close collaboration with J.A. Baillargeon, by one of Seattle’s important and prolific architecture firms. The Saunders and Lawton partnership was formed in 1898 by Charles Saunders and his former draftsman, George Lawton. Saunders and Lawton were responsible for the design of numerous commercial and apartment buildings throughout the city during this era. Saunders and Lawton were supervising architects on the construction of the Alaska Building (1904) designed by Eames and Young. They also designed a number of warehouse buildings in the Pioneer Square-Skid Road National Historic District, including the Norton Building of 1904, the F. X. McRory Building (formerly the McKesson and Roberts Building) of 1906, the Westland Building of 1907, the Crane/ Goldsmith Building of 1907 (part of the Court in the Square), and somewhat later, the Polson Building of 1910. The fate of the department store is not fully known; it appeared to have ceased operations in 1911 or 1912 after Mr. Baillargeon suffered an illness and disposed of this business. However, a Webster & Stevens photograph dated 1916 indicates that the department store was in use and the Rathskeller was located at the basement level. 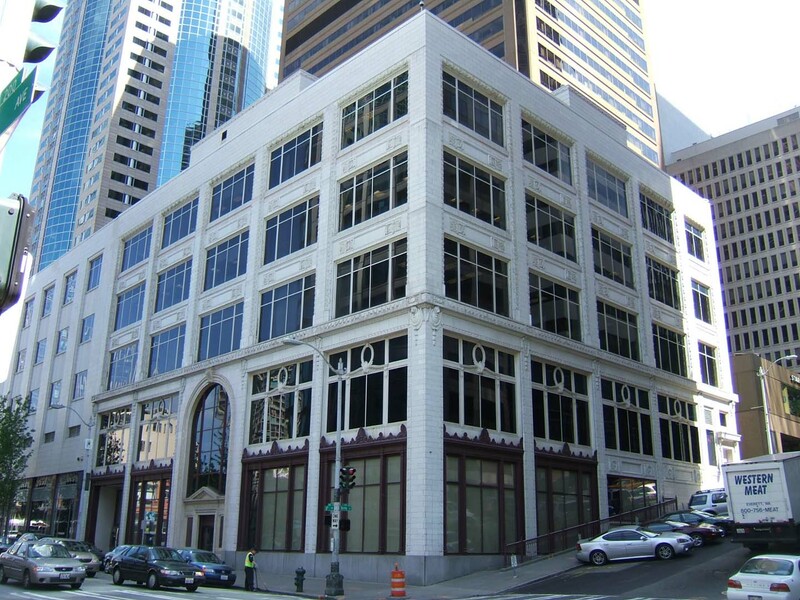 It also appears that a portion of the building began to be used by the Federal Reserve Bank of San Francisco as early as 1913, shortly after its founding. The building was purchased by the National Bank of Commerce in 1918 and in 1919-20 it underwent a major interior and storefront remodeling in order to serve as the bank headquarters. The bank had been previously located at Second Avenue and Spring Street. The remodel design was undertaken by the firm of Doyle and Merriam. Albert E. Doyle is considered to have been Portland’s most distinguished and prolific architect of the era. He had apprenticed to the Portland firm of Whidden & Lewis and also received training at Columbia University and the office of Henry Bacon, the designer of the Lincoln Memorial. In 1907, Doyle opened his own office in Portland and quickly gained notoriety for the purity of his classically-inspired design work. His design of U.S. National Bank in Portland (1916) was widely acclaimed, after which be gained many other bank design commissions throughout Pacific Northwest. Several other commercial projects in downtown Seattle were also designed in partnership with C.A. Merriam, including: the J.S. Graham Store (Doyle Building, 1919-20); Seattle National Bank (United Way, 1921); and Seattle Trust and Savings Bank (Pure Fitness, 1922 remodel). By 1937, in addition to the offices and operations of the National Bank of Commerce the upper floor levels housed Federal Reserve Bank of San Francisco (on 3rd floor) and the Hamburg-American Line housed (on 4th floor). In 1941, the fifth floor level was added; it was designed by C.A. Merriam. In 1957-58, further alterations were made to the J.A. Baillargeon Building by George W. Stoddard, who designed the adjacent and interconnected bank building, in order to integrate it with the modern addition. This is a partially intact highbred example of a particularly rare and important downtown property type that is directly associated with both local department store and banking history. It is associated with a person of significance, J.A. Baillargeon and three notable architecture firms: Saunders and Lawton; Doyle and Merriam; and George W. Stoddard. Together, with the National Bank of Commerce/Security Pacific Building, the buildings represent an illustrative whole indicative of the historic evilution of this banking and retail corridor. The Baillaergeon Building is prominently located at the sloping NE corner of Second Avenue and Spring Street and has been functionally interconnected to the adjacent National Bank of Commerce/Security Pacific Building since that building was constructed in 1957-58. [The National Bank of Commerce/Security Pacific Building is identified/discussed according to a separate Inventory Form.] This five-story building was originally designed and constructed in 1907-08 as a four-story building, which initially served as a dry goods and furnishings store known a J.A. Baillaergeon and Company. It was remodeled and adapted c.1918 to serve as a bank and is now used for commercial office purposes. The fifth floor level was added in 1941. The building measures 120’ x 108’ and includes a heavy steel and concrete reinforced foundation and basement level. It exhibits a two-part vertical block façade composition and incorporates architectural details and features using classical motifs. The Second Avenue façade and the Spring Street elevation are both divided by five structural bays. Portions of the original 1908 building base remain in place at the second floor level including ornate tripartite cast iron window frames with wreath ornament at the central panel. Original ivory color terra cotta cladding and ornament remain at the structural piers, window surrounds and pier caps that are decorated with terra cotta cartouches with lion’s heads and with distinctive shields inscribed with “B” in recognition of the original building name as well as the principal building owner and developer. The base is terminated by an original ornately decorated terra cotta intermediate cornice. The third and forth floor levels within the shaft exhibit original 1908 ivory color terra cotta cladding and ornate windows surrounds and decorated spandrels. When the fifth floor level was added in 1941 the original sheet metal cornice was removed. Cladding and window openings at the fifth floor level match the original design. The shaft is capped by an unadorned plain terra cotta-clad parapet wall. The original storefront design and central entryway were altered when the building was adapted and modeled for bank use purposes c.1918. The original entryway had a square-headed opening and was adorned with ivory-color terra cotta and a crested cornice and ornate metal canopy. It was replaced with the current storefront configuration and entry design. The ivory terra cotta clad entryway is accentuated by a two-story arched portal within which is a finely detailed classical pediment flanked by rose-color polished marble panels. This entryway has been blocked off and is no longer functional. The storefront level initially included large display windows with traditional mezzanine windows and a low bulkhead. All of the original window panels and the bulkheads were replaced c.1918 with ornate cast iron surrounds distinguished by a cresting cap (of shell and flower. fleur-de-lis motifs) and a continuous granite bulkhead, which all remain in place. The northernmost storefront bay appears to have been originally used a secondary entry to basement and upper floor level uses. It is now the main entry to the elevator lobby that serves both the Baillaergeon and the Security Pacific Building. This entryway has been modernized. An additional ornate terra cotta clad entry vestibule is also located at the east end of the Spring Street elevation. In 1957-58 when the adjacent Security Pacific Building was constructed, the Baillaergeon Building became functionally interconnected to the new building with a common elevator lobby. All of the original tripartite upper floor level windows were replaced with steel sash in character with the adjacent addition. Those windows were subsequently removed and the all of the current windows appear to be a modern aluminum product. Reportedly, portions of historic interior finishes and features may remain in place within the remodeled banking hall which is no longer open to the public. The lobby is believed to include inlaid-marble floors, marble clad columns and wall surfaces, areas of coffered plaster ceiling and some marble furnishings. Additional field investigation is required to determine if there are intact or architecturally significant interior building features or finishes. "New Baillargeon Building Finished" Seattle P.I., September 6, 1908.